Coriander, also known as dhania, cilantro or Chinese parsley is a herb in the family Apiaceae. It is an annual fast growing herb with feathery leaves and large white umbrella flower heads. Continue reading below to learn how to grow coriander at home following the simple easy to follow instructions. I am growing coriander in Sydney for the last several years. Growing coriander from seeds in pots or garden is easy, even indoors, if you follow the instructions including plant's care, fertilization and harvesting. Coriander plant grows to a height of 50 cm. Its leaves are broadly lobed when young and slender and feathery higher on the flowering stems when the plant flowers. All parts of the coriander plant- leaves, seeds and roots are edible, but the fresh leaves and the dried seeds are mostly used in cooking. The coriander roots have a more intense flavour than the leaves and are commonly used in Thai dishes like soups and curry pastes. One herb, two names! Cilantro or Coriander? Is there any difference between coriander and cilantro? Cilantro and coriander are the two names of the same herb Coriandrum Sativum. In some countries, the fresh leaves are known as cilantro and the seeds are called the coriander, while in some countries like India, the name coriander (dhania) refers to fresh leaves and the seeds as well. Some calls coriander and Chinese parsley. Cilantro is the Spanish word for coriander. You can grow coriander from seeds or seedlings. The easiest method of growing coriander is to regrow from roots (How to regrow coriander from roots). Coriander grows well in pots or in garden beds. A pot of size about 25 cm is adequate. The advantage of growing coriander in a pot is that the pot can easily be shifted in sun or indoors. Also the pot can be placed in the kitchen to have easy access to cilantro. grown during summer but the plants change quickly to seeds known as ‘bolting to seed’. If you have very hot weather, grow your cilantro plants in partial shade. In cooler places, grow the plants in full sun. Soil: Plant in a freely draining rich soil. Add some cow manure in the soil before planting. Read on how to prepare garden soil. Coriander Seeds or Seedlings: Coriander is grown directly from seeds, as it does not grow well if transplanted. However, seedlings are sold at most garden centres. Buy the smallest seedlings, rather than big ones. Separate the seedlings and plant them spaced 20 cm apart. 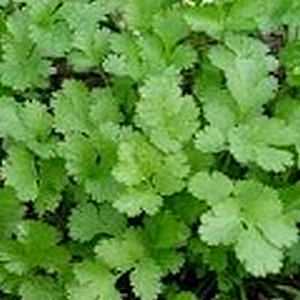 Grow Coriander from the Seeds: The good thing about cilantro is that it can be grown from the store bought coriander seeds from the spice section of the store. The coriander seeds is readily available in most kitchen. Sow coriander seeds about 1 cm deep, cover the seeds with soil, and keep damp. You can spread the seeds and rake in the soil. Apply mulch to retain moisture and prevent weeds. Keep the pot in sun. It is important to keep the soil moist during their germination. The seeds take about two to three weeks to germinate. I generally sow the seeds in rows for easy harvesting. If you buy cilantro from a nursery in a pot, don't re-pot the seedlings. Just use the leaves in your dishes and harvest the seeds for next season. Mulch: Mulch the plants to prevent the weeds from growing. If you have sown the seeds by spreading the seeds in the soil, then thin the seedlings to about 15 cm apart. Watering: Do not overwater the plants, just keep them moist. It is important to ensure that the cilantro plants never dry out. Otherwise, they will bolt and grow flowers prematurely. Fertilizer: No fertilization is required, although some dilute liquid nitrogen fertilizer like fish emulsion can be given every third week. I sow cilantro every few weeks during the growing season so that I can have a continuous supply of coriander leaves fresh from the garden for a longer period of time. Coriander has a habit of bolting to seed if the weather turns from hot to cold or cold to hot. There are several ways to grow strong and healthy coriander without bolting to seed. Choose the seeds or plants that are labelled as slow bolt. Sow the plants directly from the seeds. This is a very fast and inexpensive process. Coriander plants do not have any pest and disease problems. Sometimes, aphids, mildew, leaf hoppers and fungal wilt can be a problem. The insects can be controlled by washing with an insecticidal soap solution. Coriander dhania should be harvested often by taking the outside leaves from the base of the plant. The best flavour comes from the younger leaves. I snip off as many coriander leaves as I need, they will regrow quickly. After sometime, the plants will start flowering. Once they start developing flower stalks, they stop making more leaves. I therefore chop the branches which are starting to flower. This way the plants go bit longer. When the plants flower, I stop harvesting the leaves and leave the flowers alone to set seeds. When the seeds become dry, I store them for sowing in the next season. However, the cilantro grows itself in the next season because many seeds that fall on the ground get germinated. Place the coriander pot indoors at a place where it can receive direct sun for 3-4 hours. If you do not have such a location, then place the coriander pot in the brightest place and take out the pot in sun for a few hours every 3-4 days. Artificial light from light globes/bulbs may help. Do not over water the coriander plants, specially if growing indoors. Water only, when the soil feels dry on touch.